The nightmare before this Colorado Christmas was front-page New York Times news. 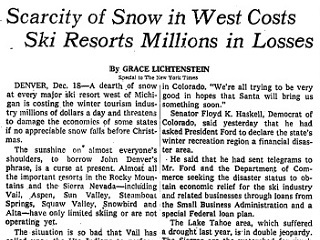 On Sunday Dec. 18, 1976, The New York Times ran a front-page story about the scarcity of snow at West Coast ski resorts. Forty years later, Colorado newspaper Steamboat Pilot & Today has revisited those times in a Sunday front-page story of its own, to remind downhill skiers and snowboarders just how tenuous things were before the industry properly invested in snowmaking machinery. Things looked dire for Colorado’s ski resorts in December 1976, a priest in Aspen held daily prayer services and vowed to fast until it snowed. Vail paid a group of Ute Indians to come and dance for the white stuff. And in Steamboat Springs, hundreds of townspeople eagerly went to the top of Thunderhead and shoveled snow onto runs they had shaken off of trees and onto Visqueen sheets. Others filled garbage bags with snow and moved them to the slopes. From there, the article offers a refresher on how instrumental the winter of 1976-77 was, along with another tough one a few years later, in moving ski resorts to a point where they are not so reliant on Mother Nature. The loss to the Steamboat Springs community that 1976-77 season because of the mild winter was calculated to be more than $15 million.